Amelia Earhart was an American aviation pioneer and the first female aviator to fly solo across the Atlantic Ocean. Amelia Earhart was an American aviation pioneer and the first female aviator to fly solo across the Atlantic Ocean. She received the U.S. Distinguished Flying Cross for this record and set many other records as well as becoming a best-selling author. She disappeared flying over the central Pacific Ocean on July 2, 1937, and was never found. 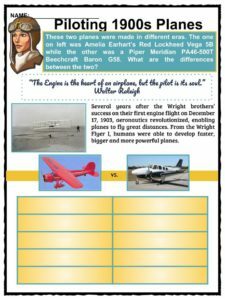 See the fact file below for more information on Amelia Earhart or alternatively, you can download our 26-page Amelia Earhart worksheet pack to utilise within the classroom or home environment. 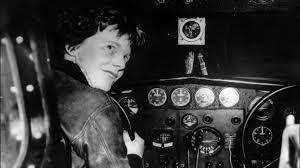 On July 24, 1897, Amelia Earhart was born in Atchison, Kansas, to Amelia “Amy” Otis and Edwin Earhart. Young Amelia spent most of her childhood with her maternal grandparents. Amelia and her family moved from one place to another because of her father’s financial instability. As a result, Amelia had a hard time making friends but showed an interest in science and sports. In 1915, Amelia’s parents separated again. Together with her mother, she moved to Chicago where she attended Hyde Park High School. Earhart volunteered as a nurse’s aid for the Red Cross after witnessing wounded soldiers returning from World War I. She started to admire aviators and spent most of her free time watching the Royal Flying Corps practice. By 1919, she enrolled at Columbia University to study medicine but later quit to join her reunited parents in California. 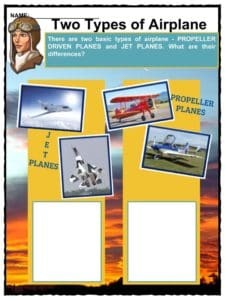 She and her father attended an “aerial meet” in Long Beach and that was where she became interested in flying. The next day, given a helmet and goggles, she boarded the open-cockpit biplane for a 10-minute flight over Los Angeles. She immediately began taking flying instructions from pioneer aviatrix Anita Snook. On December 28, 1920, pilot Frank Hawks gave Amelia her first ride in an airplane. She then took her first flying lesson on January 3, 1921. Amelia’s first plane was a bright yellow Kinner Airster that she nicknamed “The Canary”. Earhart cropped her hair short and slept in her leather jacket for days to look like women aviators. On October 1922, she set a women’s altitude record of 14,000 feet, which was later broken by Ruth Nichols. She was the 16th woman to receive a pilot’s license from The Federation Aeronautique. After some financial and career detours, she became the first woman pilot to fly as a passenger across the Atlantic Ocean, in 1927. In 1932, she became the first woman to pilot a plane across that ocean and was awarded the Distinguished Flying Cross. In April 1935, she flew solo from Los Angeles to Mexico City, followed by her tour from Mexico to New York. From 1930 to 1935, Earhart set a record in distance aviation in a variety of aircraft. On June 1, 1937, Amelia and her navigator, Fred Noonan, departed Miami, Florida, bound for California to travel around the world. While living in Boston, Amelia wrote articles promoting flying in the local newspaper. From 1928 to 1937, she traveled far and across countries. On July 2, she took off from Lae, New Guinea. Her last radio contact reported was on a course for Howland Island. It has been determined that the plane went down some 35 – 100 miles off the coast of Howland Island. An extensive search was conducted at a cost of over 4 million dollars. Her attempt to be the first person to circumnavigate the world around the equator led to her disappearance. 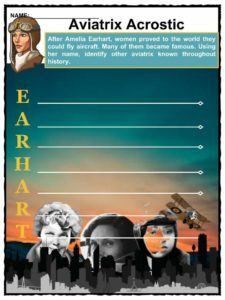 Since her disappearance, Earhart’s body has never been found, though some investigations claimed that they uncovered evidence of Earhart’s bones and plane. What happened to her remains one of the greatest unsolved mysteries of the 20th century. Among the speculations is the ‘crash and sink’ theory, which suggests that Earhart and Noonan’s plane ran out of gas and crashed into the open sea near Howland Island. The TIGHAR or The International Group for Historic Aircraft Recovery postulates that Earhart and Noonan landed to the southwest of Gardner Island, now Nikumaroro, in the Republic of Kiribati, which was not inhabited during those times. They believed that the two may have survived several weeks on the island as castaways. Amelia Earhart was the first woman and people to fly solo both across the Atlantic and the Pacific Oceans after her trip from Honolulu, Hawaii, to Oakland, California. She became the first president and co-founder of the Ninety-Nines, an international organization for the advancement of female pilots. 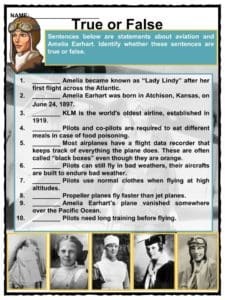 For several decades, Amelia Earhart Day is celebrated every July 24th, the aviatrix’s birthday. Air Traffic Controller – This person works in the control tower and talks to pilots by radio. An Air Traffic Controller tells the pilots when and where they can land their planes at the airport. Callsign: Phrase used in radio transmissions to identify an aircraft, before proceeding to actual instructions. A callsign for a commercial aircraft may be “Swissair 111” or “TWA 800”. As for a private plane, it could be something like “Cessna 13 Whisky”, “Baron 232 Zulu” or “November 17 Victor”. Military callsigns, including transport of heads of state or government officials, are more diverse and depend on squadron, type of mission, etc. Cockpit – Area located at the front of the plane where the pilot and co-pilot sit. All of the instruments and controls needed to fly the plane and talk to the control tower are also located in this area. Mayday: The international radiotelephony distress signal. When repeated three times, it indicates imminent and grave danger and that immediate assistance is requested. (It originally comes from the French words: m’aider, which means: ‘to help me’). Did you know that pilots use NATO phonetic alphabets? 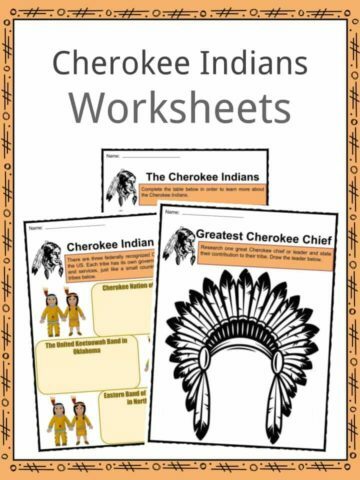 This is to reduce the possibility of miscommunication such as missing letters. If you hear “…avo”, you know the pilot said “bravo,” but not all people can understand words especially when communication is slightly difficult. Sometimes, it can be very hard to make out the difference between “n” and “m”, or “b”, “c”, “d”, “e”, etc. so pilots need to spell them out. Also, as the standard language for aeronautics is English, it can avoid confusion while pronouncing some letters for non-native English speakers: for example, in French, “j” is pronounced like “g” in English, and “i” like “e”. On the other hand, “Juliett”, “Golf”, “India” and “Echo” are pronounced the same pretty much everywhere. 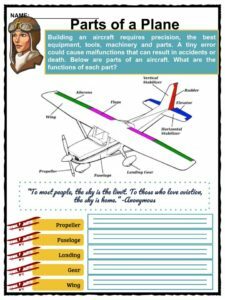 This is a fantastic bundle which includes everything you need to know about Amelia Earhart across 26 in-depth pages. 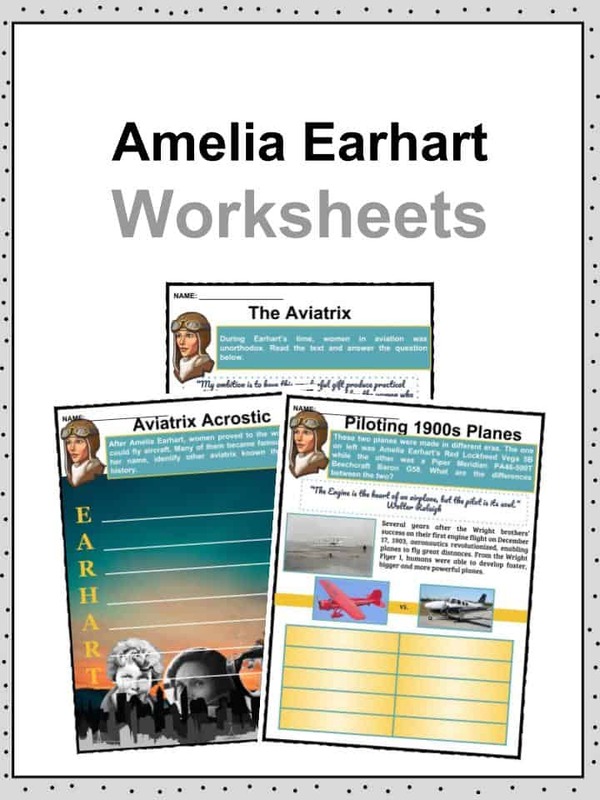 These are ready-to-use Amelia Earhart worksheets that are perfect for teaching students about Amelia Earhart who was an American aviation pioneer and the first female aviator to fly solo across the Atlantic Ocean. She received the U.S. Distinguished Flying Cross for this record and set many other records as well as becoming a best-selling author. She disappeared flying over the central Pacific Ocean on July 2, 1937, and was never found.